What are the mistakes that beginner musicians make and how can you avoid them? A lot of people who start learning a musical instrument make very similar mistakes. In this article we will take a look at some of those mistakes and also talk about how you can avoid them, so that you can speed up your progress with learning your instrument and become the musician that you want to be, faster. A common mistake with beginners is that they pick up their instrument when they feel like it. A much more effective method is to plan your practice time at the start of the week, and then to stick with it through the week. This way you know exactly how much practice you will get done and you can plan it around your other activities. This one is prevalent with beginners and intermediates. Curiosity is a good thing to have. But once you have the answer, you need to work the answer. Let me give you an example. Let’s say your guitar teacher is teaching you about modes (we will make the assumption that you chose a great teacher). When you go home and practice, rather than practice, you instead look up modes on google, find 30 different ways to learn them, and try bits and pieces of everything rather than focussing on what your teacher told you to do. Let’s say you had a 60 minute block of time for practising. Let us also say that you have found 29 new ways to learn modes online, so including the method your teacher showed you, you have 30 ways to learn modes. You decide to split your time into looking at all these systems. Your practice time is split into 30 parts, so you can spend 2 minutes on each system. I’m sure we can agree that you don’t learn very much in 2 minutes! Now, if you instead spent that time focussing solely on the system that your teacher showed you, you would have spent 60 minutes improving your understanding, knowledge and ability with the modes. Even if the system your teacher showed you was not the best (however, if you find a great teacher, then you will get the best system), by putting all that time, and focus, into learning that system, you will improve your playing and understanding of the modes. Stick with the plan – don’t get side tracked! Did you go to University? If you did, you will be able to relate to the next example really well. If you didn’t, then use your imagination, the next example will shed some light on the approaches you have been taking to your practice and playing. No, you wouldn’t. That would be ludicrous! Comparing yourself, a beginner, to someone who is at the top of their field, is a non-sequitur. It doesn’t make sense. It’s ludicrous! So why do you do this with your guitar playing? Beginners, or people who are just thinking about starting to play an instrument, are often experts at putting themselves down. Don’t focus on being unable to play something that a touring and recording professional with 15 years experience can do. All you need to focus on, is the next step that you have to take. If you keep going one step at a time, you will make the journey and reach the level you want to reach. If you view the entire journey as a single, gigantic step, you will never get started, let alone improve. Don’t make a false comparison, just take the next step. 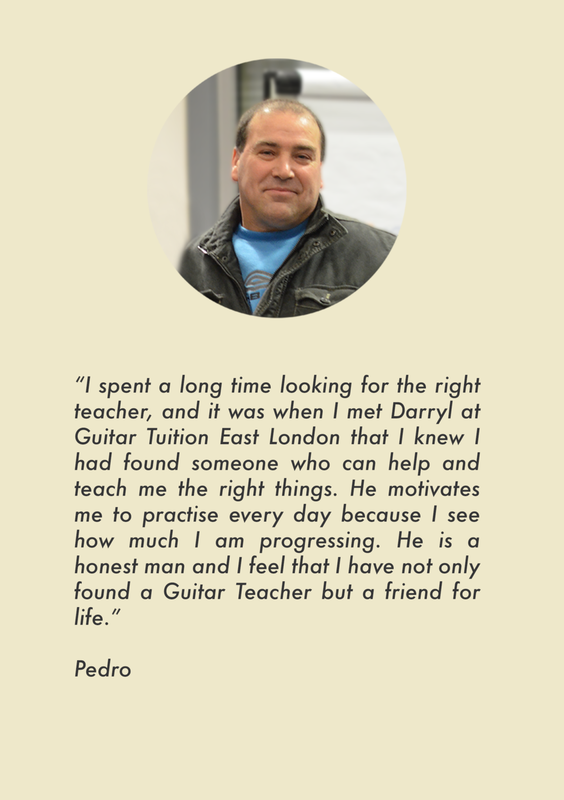 If you are interested in taking the next step with your playing and becoming the guitar player that you want to be, you can study how to play electric guitar with West London School of Guitar.